As one of the best replacement/Upgrade model for famous 5B devices, the OM5 series modular signal conditioners provide a low cost, high performance method of inter-connecting real-world analog signals with data acquisition, monitoring or control systems. 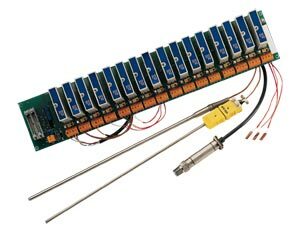 They are designed to interface directly to analog inputs such as thermocouples, RTDs, strain gages and voltage or process current signals. Individual OM5 modules convert these inputs to standardized analog outputs compatible with high-level analog I/O systems. The OM5 is designed to provide easy and convenient solutions to signal conditioning problems of both designers and end users in measurement and control applications. Typical uses include mini- and microcomputer-based measurement systems, standard data acquisition systems, recorders, and dedicated control systems. The OM5 is ideally suited to applications where monitoring and control of temperature, pressure, flow and other analog signals is required. Nota: Contact Engineering for custom configurations.